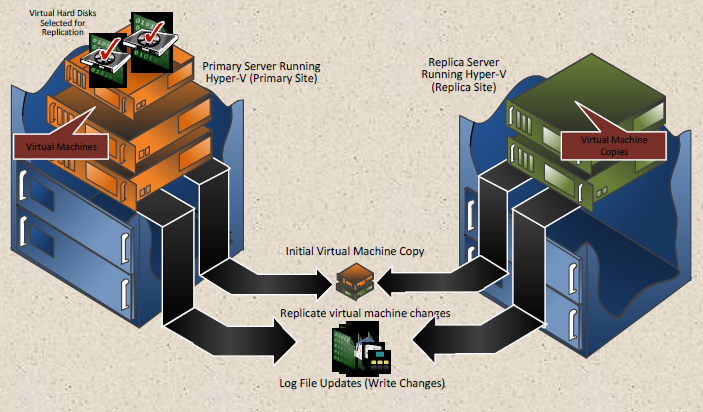 The “Replica Replica” in Hyper-V | Full of I.T. In today’s article in the “Why Windows Server 2012 R2” series, I’d like to show off a new feature in Hyper-V; something I like to call the “Replica Replica”. As many of you know, Microsoft introduced a new, powerful tool for your disaster recover (DR) tool belt called Hyper-V Replica back in Windows Server 2012 Hyper-V and Hyper-V Server 2012. For those of you who are not yet familiar with it, a Hyper-V Replica is an easily created and up-to-date offline copy of a virtual machine. On some other host – either in your local or in some remote datacenter – you have a copy of a virtual machine that can be available in case of disaster. If something bad happens to the production machine, you can failover to the replica virtual machine very quickly. We’ve added the ability to create yet another replica. It’s a replica of the replica. It’s an additional offline copy of a virtual machine and its configuration, made available, synchronized and automatically kept up-to-date on yet another Hyper-V host. Interestingly the request was from our many hosting providers, and it makes a great deal of sense in their scenario, where they are the ones hosting a replica on behalf of their customers. It only makes sense that they would love to have a backup of the replica they’re hosting.. so why not make it a replica of the replica? You pick a replication frequency. NOTICE that I have two choices here, because I had selected the primary replica as sending changes every 5 minutes. Your choices will depend upon what you selected for the first replica frequency. You may not know this (yet), but Hyper-V Replica in Server 2012 R2 allows for more than just the 5 minute intervals that were in the original Hyper-V Replica in Server 2012. You can have replication send changes every 30 seconds, 5 minutes, or 15 minutes for the first replica. For the extended replica, you must replicate at an interval that is less-or-equally-frequent to the first replica; with the exception being that you cannot replicate the to the extended replica at the 30 second interval. And Finish. We’re done. And the first extended replication is now going over the wire. I see that I have similar options to what I had back in Hyper-V 2012. But now I have an additional “Pause Extended Replication” option as well. Let’s say I have a virtual machine “DukeN” running on Host A, with replica on Host B and extended replica on Host C.
Host A goes down. So I right-click on the “DukeN” machine and select Failover…, and DukeN fires up and is now running on Host B.
I can “Reverse Replication”, which means I can now treat this running (but still considered a replica) machine as the primary machine, and begin replication back to what was the primary location. Note: if you do this, it essential "orphans” the old extended replica. You’ll have to re-extend the replication if you want to. I can “Remove Recovery Points..”, which does cleanup of this replica of any other points still saved. I can “Cancel Failover”, which will shut this replica down and assumes that the original machine is now available and can be started. I can “Resume Extended Replication”. This one is interesting to me. It assumes that Host C (containing the extended replica) is still available. When selected from Host B, then Host B becomes the main VM and the copy on Host C becomes the first replica. Once a synchronization process is completed, you can then go to the VM on Host C and Extend Replication to another host (Host D?). Good stuff? Try it out yourself by downloading the evaluations of either Windows Server 2012 R2 or Hyper-V Server 2012 R2. And let me know if you have any comments or questions by posting them in the comments section. Can we force the Replica to use a dedicated network between two hyper-v hosts? Each network with a specific VLAN to isolate the traffic. The two Hyper-V boxes are in the same LAN.